Today is the feast of St John the Evangelist, the patron of my church. The Fathers of the Church believed John the Evangelist was the author of the Gospel, three Epistles, and the Book of Revelation, and the same person as John the Apostle and John of Patmos. Later scholars suggest rather that a disciple of John the Apostle wrote the Gospel and three Epistles and that John of Patmos was a different person, because the writing style of the Book of Revelation is too different from the Gospel and Epistles. 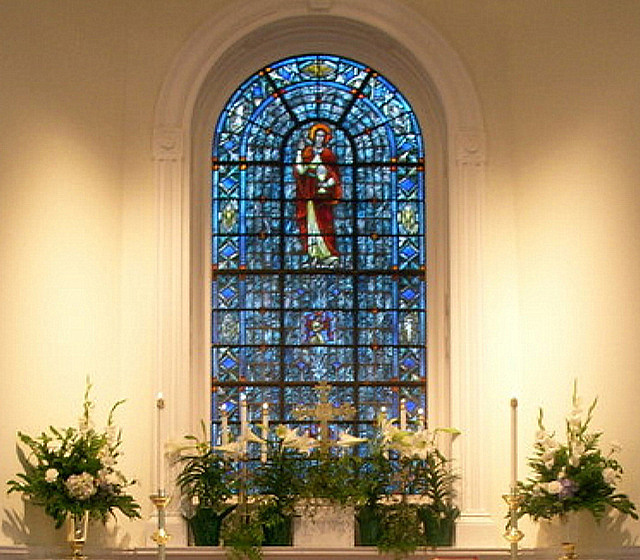 Pictured above is the stained glass window at St. John's Episcopal Church in Thibodaux. If you click on the picture, you see (somewhat blurred) the detail in the glass which shows a snake coming out of the goblet in John's hand. According to legend, the emperor Domitian offered poisoned wine to John, but he blessed the wine and the poison came out of the goblet in the form of a snake. A painting by El Greco illustrates the same legend. Archdruid Eileen posted a lovely poem (hers I assume, since there is no citation) in honor of the feast day. Nearly 100 years passed between the two photos. The words over the arch are "The Lord Is in His Holy Temple". The plaque holding the hymn numbers situated on the arch seems to be the same, painted white from black or a dark color, and moved to the left on the wall. Our best guess is the old picture shows a reed organ on the left in the front of the church. When the Victorian decorations around the archway and windows were painted over, I can't say, but by 1969, when we moved to Thibodaux, the decorations were gone. And all to the good, in my opinion, in our beautiful Greek Revival style church. 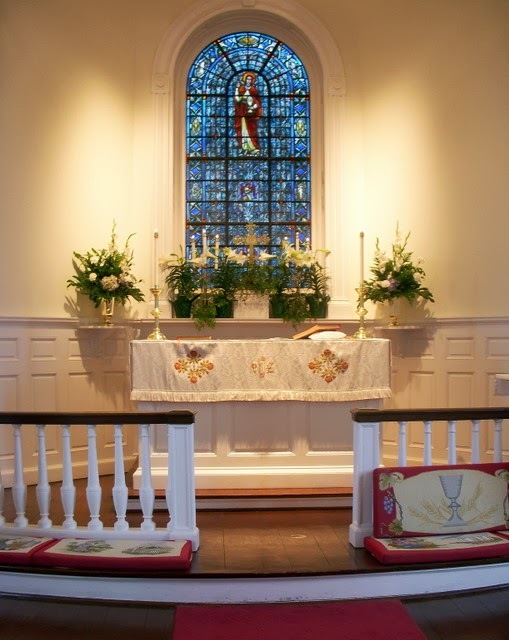 St. John's Episcopal Church is locally important because it is the oldest remaining church building of the Episcopal Diocese of Louisiana west of the Mississippi River. The square on which it is located has been the home of the church parish since it was organized by Bishop Leonidas K. Polk on February 9, 1843. Even though the building underwent some alterations in 1856 and again in 1867-68, it is still a good example of the Greek Revival style, with its classical pilasters across the front and two sides, its entablature with dentiled cornice, and its pedimented gable end on the front. 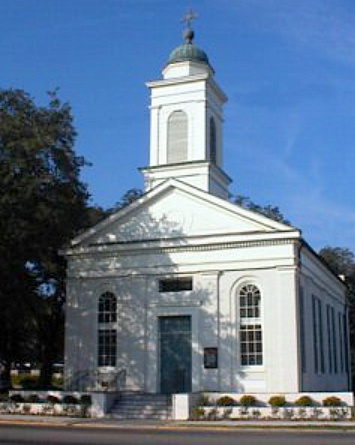 The use of the Greek Revival style for St. John's Church, probably due to its 1840's date of construction, separates it somewhat at least visually from the other Episcopal churches started by Bishop Polk in Louisiana. Most, if not all, of these other churches, which were built in the mid-nineteenth century, are believed to be in the Gothic Revival style. St. John's suffered interior damage from occupation by Federal troops during the Civil War. Services were suspended at that time. 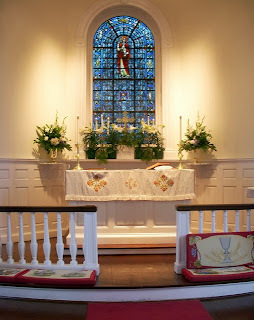 The church was repaired and refurbished after the Civil War, and a recessed chancel was built in 1867-68, with a stained glass window in the west wall, at a cost of $1,500.00 This was the last structural change to the fabric of St. John's Church, although the original stained glass window was replaced in 1937 by the present one. The exterior brick received a cumulative layer of yellow paint, covering the soft red brick until 1969 when it was removed. Thus, St. John's Episcopal Church now appears to passersby on Jackson Street as it did in the mid-nineteenth century. Sometime later than the old picture, an enclosed choir stall was built where the organ stands, but, in a later restoration, the stall was removed to open up the space and return the chancel to its lovely original symmetry. Today, the organ console is in the right front of the church, and in the left front stands a fine Yamaha grand piano on loan to the church for our use in services and for the use of visiting musicians in the Music at St John series. The pipes for the 1893 Ferrand & Votey organ, situated in the loft of the church, are shown below. Further information on the pipe organ may be found here. My original intention was a simple compare and contrast of the interior of the church then and now, but the post turned into a tour de force of St John's Church. I'm not called the long-winded lady without reason. Below is a picture of the exterior of the church, in the event you're curious after seeing the rest of the photos. As you see, the bricks have, once again, been painted, this time white. Today is Day 3 of the 12 Days of Christmas and the feast of St John the Evangelist, the patron of my church. The Fathers of the Church believed John the Evangelist was the author of the Gospel, three Epistles, and the Book of Revelation and the same person as John the Apostle and John of Patmos. Later scholars suggest rather that a disciple of John the Apostle wrote the Gospel and three Epistles and that John of Patmos was a different person, because the writing style of the Book of Revelation is too different from the Gospel and Epistles. 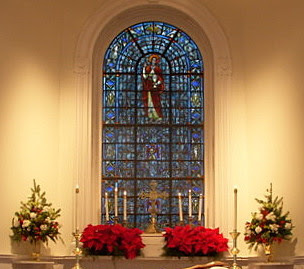 Pictured above is the stained glass window at St. John's Episcopal Church in Thibodaux. The detail in the glass shows a snake coming out of the goblet in John's hand. According to legend, the emperor Domitian offered poisoned wine to John, but he blessed the wine and the poison came out of the goblet in the form of a snake. A painting by El Greco illustrates the same legend. At the Palm Sunday service at Trinity this Sunday morning, the senior wardens of St. John's and Trinity announced that Fr. Doug Lasiter has accepted our call to be the next rector for St. John's and Trinity. Fr. Doug has been serving as the rector of Emmanuel Episcopal Church in Miles City, Montana, and Ascension Episcopal Church in Forsyth, Montana, so he has experience working with two congregations at the same time. Fr. Doug and his wife Robi and their teenage son and daughter are excited about moving to Louisiana and becoming part of our church communities. Robi and the children have been residing in the Houston area so that their daughter, who is a highly accomplished gymnast, can have access to the appropriate facilities and training. The Lasiters are looking forward to once again being together as a family under the same roof, and Fr. Doug is very much elated about the prospect of thawing out from the long Montana winter he's been enduring. Fr. Doug has indicated that his starting date will probably be June 15th. Thanks be to God, and a warm welcome to Fr Doug and his family. Thanks in part to DST, I didn't get myself together in time to go to church this past Sunday, but, by a little before 3 PM (DST), I was together enough to attend a splendid organ concert by Dr Carol Britt at St John's Episcopal Church in Thibodaux. 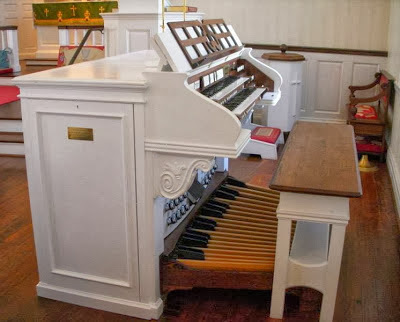 The concert was a celebration of the return of the organ to St John's after its improvement and expansion, which included an old (but new to us) console, which fits perfectly with the architectural and decorative style of the church building. Carol played beautifully. I closed my eyes to listen because I tend to get distracted by things in my field of vision - Oh look! A shiny thing! - and I wanted to listen deeply to her music. Time for the shepherds and sheep to move along and make way for the Magi. This past Tuesday evening I attended a beautiful service of Evensong to rededicate the pipe organ at St John's Episcopal Church. The 1893 Ferrand & Votey organ was repaired and restored by Redman Pipe Organs. 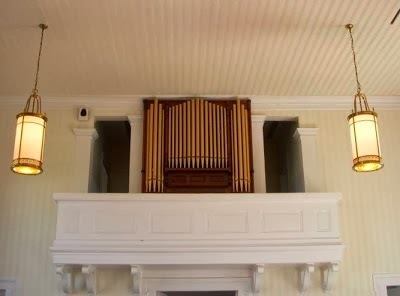 The pipes in the loft of the church were moved forward to give them a more prominent placement. The organ console is old but new to St John's. The original console was not salvageable, so the first restoration included a newly-built console. 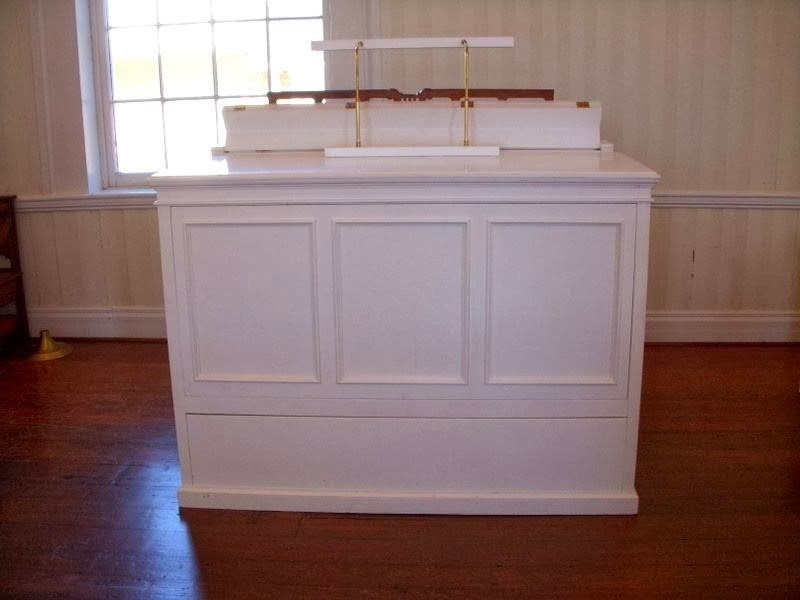 In the latest restoration, the working parts are enclosed in the antique console, which was originally painted white and only in need of a new coat of paint. The style of the piece fits perfectly with the architectural style of the church. Fr Ron Clingenpeel, our interim priest-in-charge for two years, returned to St John's to take the service which was all-around wonderful. Our very own organist, LaDonna Alexander, played beautifully, along with Carol Britt, Head of the Department of Music at Nicholls State University. 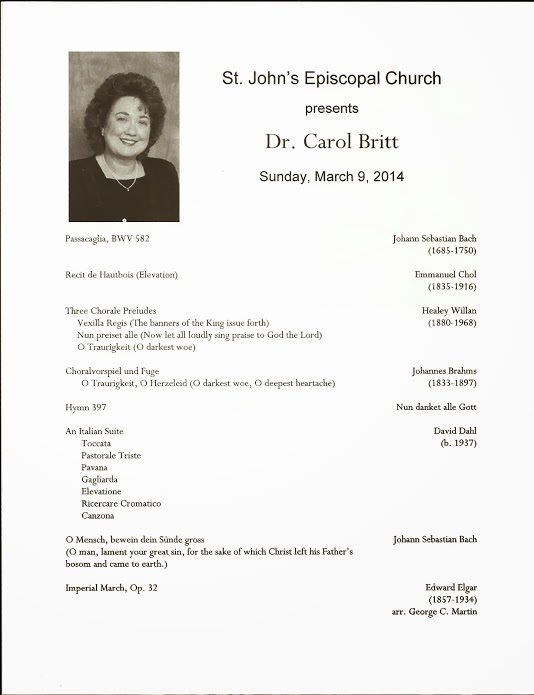 Dr Britt's Postlude performance of Johann Sebastian Bach's "In Dulci Jubilio" was splendid, indeed. Funds for the renovation of the organ came from a grant by the Lorio Foundation in memory of long-time St John parishioner, George Dickie, pictured at left. The organ, along with the people who attended the service, made a joyful noise unto the Lord Tuesday evening. 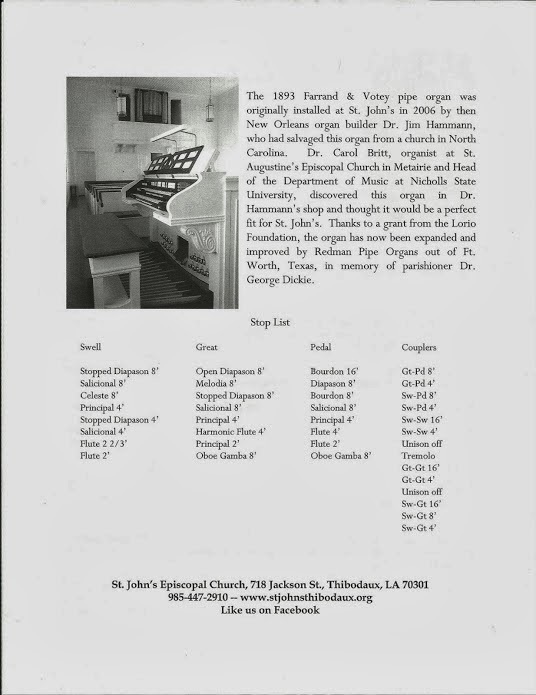 For the past several months, the pipe organ in St. John's Episcopal Church in Thibodaux, LA has been away for repairs and maintenance. 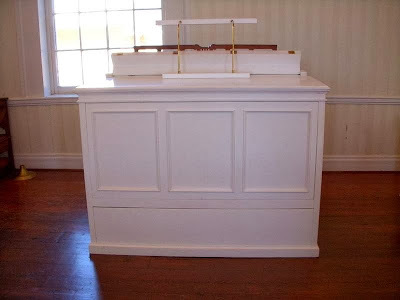 The instrument was returned to its place in the church while I was away with a new (to us) antique console. Another view of the console. The organ pipes in the loft were moved to a more forward position, which makes them stand out nicely. How lovely it was to have our wonderful old organ back in its place in the church. Like many of my fellow parishioners at St. John’s, I did not begin attending an Episcopal church until I was well into adulthood. I’ve often been asked why LaDonna and I (and subsequently our daughters) first came to St. John’s and then continued coming. There is not a simple answer, but one key element was the warmth of the people, who welcomed us as if they were greeting long-absent family. I still see the glow of that warmth whenever we gather, for Sunday services, Christian education, choir practice, work days, and our many ongoing outreach ministries. Another factor that attracted us was the liturgy of the services. 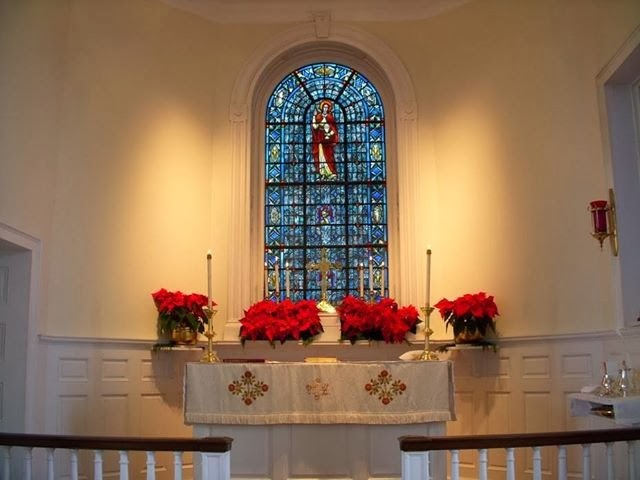 Growing up Baptist, we had rarely experienced or understood the traditional liturgies that are prominent throughout much of the Christian world, but as we worked our way into adulthood and took on the role of nomads (because one of us stubbornly refused to quit going to graduate school), we on occasion attended churches with different liturgical traditions—Methodist, Presbyterian, Catholic, Episcopal—and began to understand that there was value in the ritual, the practice, and the reflection that these traditions cultivate. So when we came to St. John’s, the liturgy of the Holy Eucharist was a powerful reminder to us of how much we had come to value those traditions that brought us together in prayer, song, and worship. Another thing that I noticed early on as we began to attend church at St. John’s was how involved lay people were in the conducting of the services—as lay Eucharistic ministers, lectors, leaders of prayer, ushers, altar guild members, greeters, and counters. My first somewhat cynical thought was, “That’s a smart way to ensure that people come to church.” But upon further more mature reflection, I came to see that involving so many lay people in the services was emblematic of an important component of church—people coming together to pray, sing, and worship. And that thought brings me back to my earlier point about part of the draw of St. John’s being the warmth and openness of the people, welcoming all of us into a new and renewing family. As we continue to live through this interim period and work toward the calling of a full-time rector, we have the opportunity to come together for both the celebration of the Holy Eucharist and for Morning Prayer. We are thankful for the supply priests who will be visiting with us to celebrate the Holy Eucharist, and especially thankful for Fr. Jerry Rogers, who has served as our celebrant when he has been able. And we are also thankful for the lay people—Fred Sollars, Julie Green, Gloria Hunter, and Mary Katherine Blackburn—who have stepped forward to serve as officiants for Morning Prayer. This has been a learning experience for all of us, and another testament to how we come together as a church family, finding new ways, and re-discovering old ways, to move forward. Dear Lord, we ask your help in guiding and directing St John's and Trinity in our search for a new rector. Where there are differences, help mold us into one heart and one mind, being ever mindful of the needs of each other. Where doubts and uncertainties may arise, grant us faith and courage to ask what you would have us do. And finally Lord, give us the spirit of your wisdom to find someone who will adopt our families as part of their family, and strengthen us as faithful ministers to do your will. In Jesus' name we pray. Amen. Thanks to Allen for permission to post his note in St John's Newsletter. After the church service on the morning of June 9, 2013, the congregation at St John's gathered for the blessing of St John's Scatter Garden. Fr Ron, our interim priest-in-charge, instructed us to pray for clear weather on the day of the blessing, but earlier in the morning, the rains came. I wondered whose prayers hadn't worked or who among us had sinned so grievously that God sent the rain despite the prayers. Fortunately, the early rain proved to be only a distraction, and the prayers were efficacious, as you see from the shadows cast by the shining sun in the pictures below. Just in case, a tent had been set up to keep the congregation dry, but instead the cover served to keep us cool and out of direct sunlight. What was the plan for Fr Ron and those who assisted him in the blessing, had the rain continued? I don't know, but with the clearing skies, we did not move to Plan B.
Fr Ron's swing with the aspergillim (Ha! I bet you're surprised I know the name of the vessel that sprinkles holy water.) is strong, indeed. Over the years, the arm and shoulder muscles have developed suitably for sprinkling. Then, too, picking and strumming the guitar year after year helps develop the finer muscles for the proper aim. Here's Fr Ron coming right for those of us under the tent aiming, no doubt, for a direct sprinkling hit with the holy water in the aspergillim. Joking aside, Julie Green, a member of our congregation, carved the lovely Celtic cross that stands in the middle of the scatter garden. Photos do not do justice to the beautiful motif carved on the cross. Once the smaller plants in the ground surrounding the cross grow as ground cover, the site will look much more attractive. My instructions to my family for when my "little life is rounded with a sleep" are for my remains to be cremated, but I had no instructions for what to do with the ashes. I think that neither they nor I would wish to have them in a box or a vase on the mantle, and I've thought and thought about an appropriate spot to spread the ashes, and, before the scatter garden came to be, I had no idea. Now the problem is solved. The garden is a lovely, peaceful area, shaded by ancient oaks. What more would they or I want? A 33-year-old man is guilty of bludgeoning a priest to death in August 1992, a verdict that brings closure to a murder mystery that stumped police for 15 years. A 12-member jury unanimously found Derrick Odomes guilty of second degree murder Thursday afternoon following a two-day trial. Prosecutors argued that Odomes bludgeoned the Rev. Hunter Horgan to death Aug. 13, 1992, inside the priest's office in St. John's Episcopal Church in Thibodaux. Odomes, who was 14 years old in 1992, was arrested in September 2007. District Judge John E. LeBlanc, who presided over the trial, ruled last year that Odomes can't be sentenced if convicted of the slaying because he was a juvenile at the time of Horgan's death. But Odomes received a life sentence last week as a result of six felony convictions he has racked up in the 19 years since the alleged murder, ensuring he will face significant jail time regardless of the outcome of the murder trial. The article reveals details which I never knew before and which I'd rather not know now, but there it is. Pray for Fr Hunter Horgan's family and all who loved him, including the parishioners at St John's, that God will give them comfort, consolation, and the peace that passes understanding to keep their minds and hearts. Pray for Derrick Odomes. Some won't like that I ask for prayers for Derrick, but Jesus said pray for your enemies. That is enough for me.